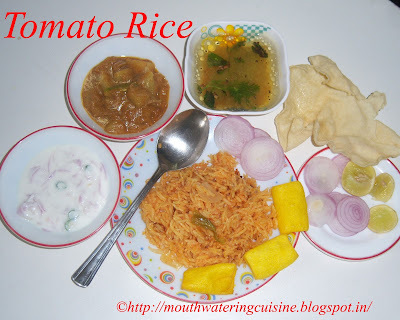 Tomato rice, is served with aloo kurma, fryums, papad, Onion Curd Chutney and Rasam. I love it very much. This tangy and spicy rice tastes well with aloo kurma. My mom used to make it nicely, I have learned it from her. Wash rice and soak it for half-an-hour. In a blender jar add in ginger, garlic and tomatoes and blend them to make a juice. Sieve the juice and measure to get 2:1 ration for tomato juice and rice. If the juice is not sufficient enough add in water. Heat oil in an electric rice cooker add clove and cinnamon. When they splutter add onions and green chilies and fry till onions turn to light brown. Add tomato juice, salt and turmeric powder, allow the juice to boil. When tomato juice is boiling add in rice. Cover it and allow it to cook. Once rice is cooked, the cooker switches automatically to warm mode. Leave it for 5 to 10 minutes like that. After ten minutes switch if off and add ghee and mix well. For mixing use only dosa spatula. 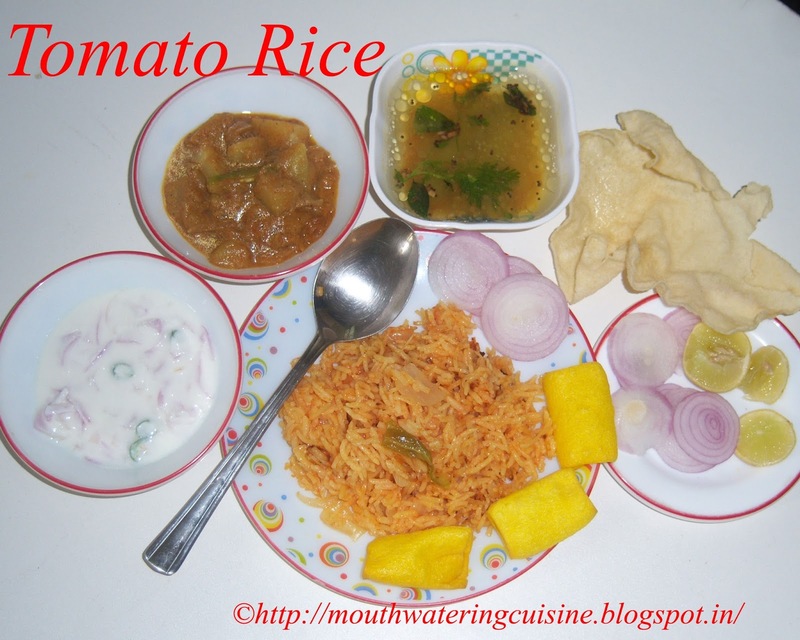 Serve tomato rice with aloo kurma.